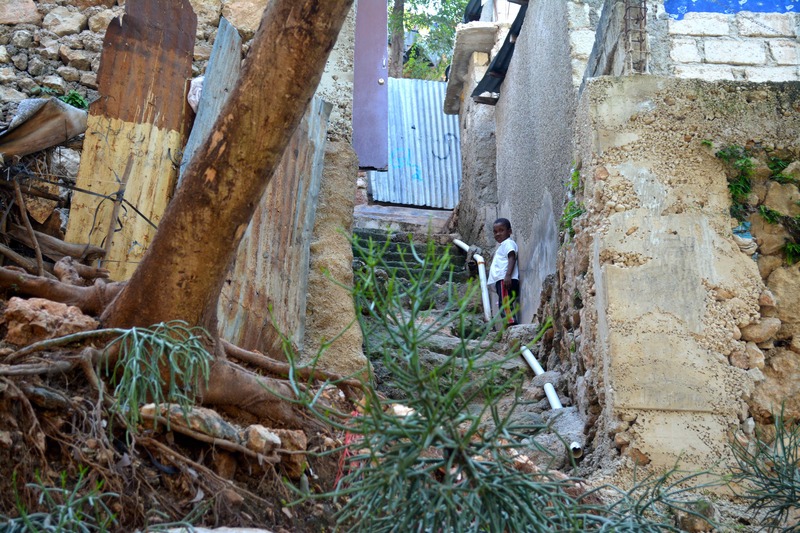 An alleyway between houses in Cite Lucien, a community at Haut Turgeau in Port-au-Prince, Haiti. Six months in, and it’s all becoming a bit more familiar. I am happy in my home in Port-au-Prince and in my neighborhood. Most of the trips I’ve taken into the countryside have been to the southern parts of Haiti, and I am recognizing the roads, the shops, even some of the people along the streets. When I visit a place for the second, third or fourth time, I am recognized, welcomed and embraced. I am becoming comfortable, but there’s a problem with that. Feeling comfortable here is one of my greatest fears. Thankfully, as my life usually goes, something happened to dropkick me out of my comfort zone. It came on Friday, innocently enough as I prepared myself for a quick (I thought) photography gig as a favor for a friend. She wanted some photos of a new project somewhere in Port-au-Prince. The newsletter deadline quickly approached, and she needed it asap. I had Friday afternoon free and quickly obliged. When the Landcruiser arrived to pick me up at Epi D’Ors, a bakery and restaurant on Delmas, arrived, I realized that no one I knew was in the vehicle. And the details about the assignment were sparse. But I was in for the ride. And – as it turned out – the walk. The region where the project will take place is called Haut Turgeau. It’s a zone along the mountainside in the southern part of the city. The vehicle drove toward the top of the hillside, then I was directed to get out and walk to the top. I’ve often glanced up at those homes on the hillsides. They look like shabby ornaments that someone has hung on a wall. How do the people get back and forth? How do they live, I’ve wondered? Well, Friday was the day I learned. Sylvio and Ronel walked with me. They explained that we would be attending a meeting later, but we also needed to take photos of the deep ravines that run through these communities. For more than two hours we walked through several hillside neighborhoods. Cite Lucien, Cite Georges, Cite Gabriel. The homes — some of them made of stone and cement block, some of them tarps spread over wooden frames — are nestled together, constructed practically on top of one another. The alleyways are narrow, steeply inclined rock walls between houses with natural “stairs” of stones of varying heights. Gravels on the smooth descending rock floors made the going even more treacherous. I adapted quickly enough to begin looking for safe places for each foot on my way down — and safe places in case I needed to reach out my hands. Safe is the operative word. A dry rock here, a piece of plywood there. In many places the wooden poles were strapped to plywood or rusty corrugated tin roofing material with rusty barbed wire. In other places, razor wire was strung along these walkways. And when I could stop to catch my breath, I’d catch glances of the residents there. At first, dead stares. Some were curious, some seemed as if I were intruding. I was. I didn’t belong there. I carried a camera. Some returned my smile, responded to my greeting. One woman looked particularly concerned for my welfare. I obviously was uncomfortable — hot, sweaty and, by this time, limping on occasion. My legs were already sore. I’d gotten a cramp in my calf, and my left knee was not happy. I didn’t know it at this time, but I still had a long way to go. There would be more hillsides to climb, more long sets of stairs to traverse and more mazes of walkways around the sides of houses crowded together. Before the assignment was done, I would walk down urban streets to catch a ride to the next community, walk so close to homes that I could hear women preparing vegetables using a pilon, a wooden mortar and pestle, for an inexpensive meal. I smelled dinner cooking and could see toddlers playing just inside doorways. I would walk along paths so narrow and on mud so slick that the possibility of falling below into someone’s roof was a very real possibility. And by the end I would recognize expressions of thanks on faces of these residents when they learned I was helping to tell their story. “We don’t have any roads,” one woman told me as I greeted her in her home. “I can see that,” I replied. “Cindy!” I heard as I walked up the last muddy path. A woman trotted to catch up carrying the lavender bandana that had fallen from my camera bag. They walk these walks every day. They live so close to one another that they can hear their neighbors sneeze. Their homes abut deep ravines that with the slightest rainstorm can send water rushing past. They live without security from crime, natural disaster or environmental catastrophe. By the time I got back into the vehicle that would take me home, I was tired and sore. I was covered with mud. I’d lost my eyeglasses. My Creole was in rare form by this time. The guys in the truck joked and laughed with me. We exchanged email addresses. I was glad I was going home, but more than that, as physically difficult as the afternoon had been, I was glad I had gone. My comfort zone once again was stretched. I was given a rare opportunity to see the lives of the people who live on those hillsides. I am confident the projects will make a difference, but I know so much more needs to be done in this city, in this country. I’ve seen poverty up close and personally in the countryside, but this was my first foray into destitute urban neighborhoods. This was on Friday afternoon, and the spiritual pain has lingered in me just like the physical ailments. Just like muscles that suddenly are stretched and depended upon, my spirit can get flabby. Yes, even here, in a place like Haiti. That is why I fear comfort, and even more, complacency. I am grateful for Friday afternoon for the privilege of walking — even for an afternoon — the walk of our neighbors. To see into their lives for a moment, into their eyes for a time. I cannot carry their needs if I cannot feel them, even for a short time. It is discomfort that makes my prayers more powerful, that urges me to lift my voice and tell their stories. Though the trip through Haut Turgeau is not a part of my work here, it opened my eyes — and my heart — even more. Poverty without a safety net at all is a scary proposition, yet that is what so many here are accustomed to. With every walk alongside my neighbors here, I feel that fear, but only for a moment. For the residents of neighborhoods like Cite Lucien, Cite George and City Gabriel, that fear is ever present.